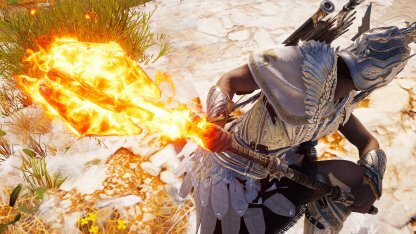 Check out the stats and how to get the Legendary weapon - Mallet of Everlasting Flame for Assassin's Creed Odyssey! 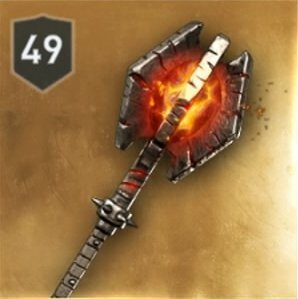 Unique Perk - "Weapon Damage becomes Fire Damage"
The Mallet of Everlasting Flame stays true to its name. It turns all Damage into Fire Damage - useful to do damage over time when facing off with multiple enemies. The Mallet of Everlasting Flame boosts your Warrior Damage & Fire Damage. It's perfect to partner with the Agamemnon armor set. Check Out The Agamemnom Armor Set! Defeat The Mercenary Titled "the Smoldering"
This legendary heavy blunt weapon is a drop from a mercenary whose name is suffixed with "the Smoldering". You will only be able to encounter this mercenary from Level 46 onwards. Make sure you are leveled & geared enough properly.